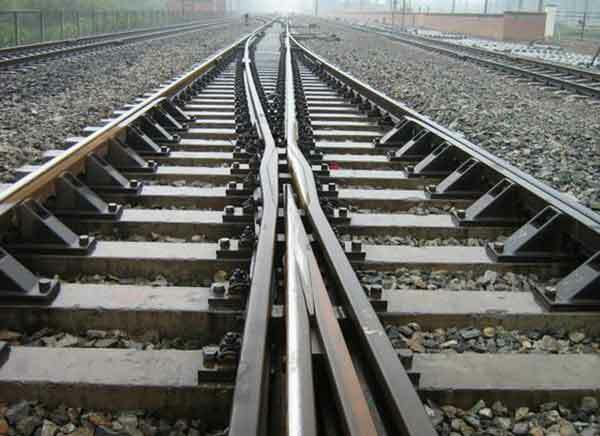 Rail pads, originally called sole plates, are elastic polyurethane mats assembled between steel rails and rail sleepers to protect the sleeper top from wearing and impacting. 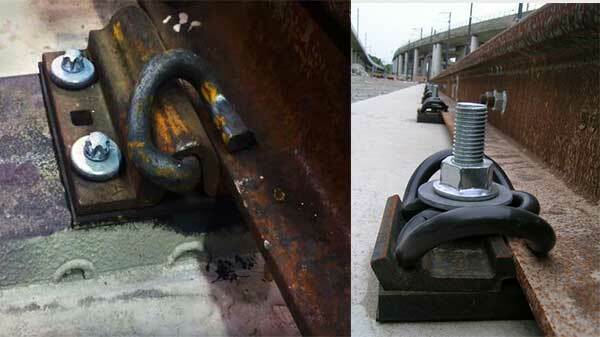 The starting stiffness of rail pads is designed not to be high so that their relative deformation under the spring clip toe loads is greatly substantial. 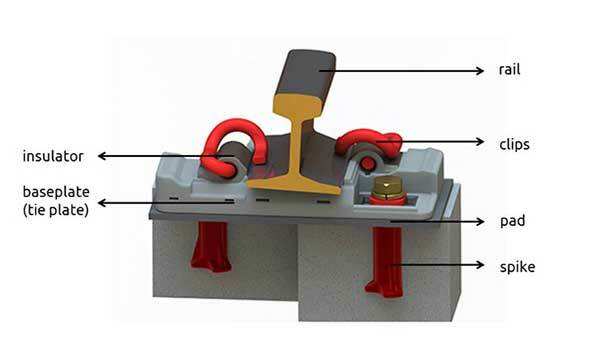 This mechanism guarantees the rail pad maintaining in close contact with the rail despite of any vertical movements of the latter. 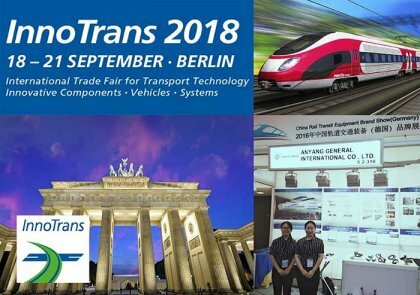 As a professional manufacture of rail fasteners, AGICO Rail can produce various types of rail pads for different rail standards, such as UIC54, UIC60, BS80lbs, BS100lbs, etc. Moreover, we can arrange customized production of rail pads according to drawings or samples. After years of experience in rail pad manufacturing, we have developed a range of high-performance elastic rail pads for stiffness requirements and various application areas-from trams through standard gauge railways to heavy haul lines, especially rail pads for E-clip rail fastening systems and SKL type rail fastening systems with material of HDPE/EVA/Rubber, with following properties respectively. In the railway system, rail pads act in two main ways: rail pads can diminish shock or impact loads by providing compliance, and they reduce (by isolation and perhaps by damping) resonant vibrations excited in the concrete sleepers (lowest resonant frequency about 200 Hz) and accommodate vibration deflections in the rail sections between the sleepers (about 0.12mm amplitude, 1000 Hz). 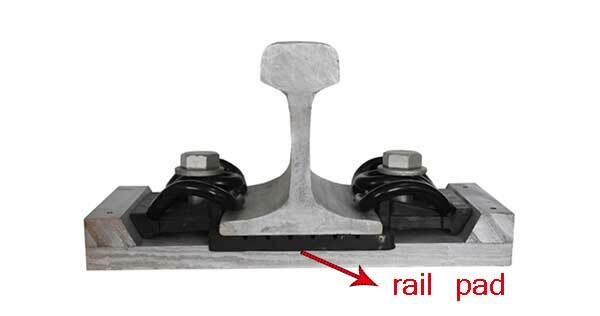 In addition rail pads prevent rail sleeper abrasion, and crushing of the sleeper under the rail foot. 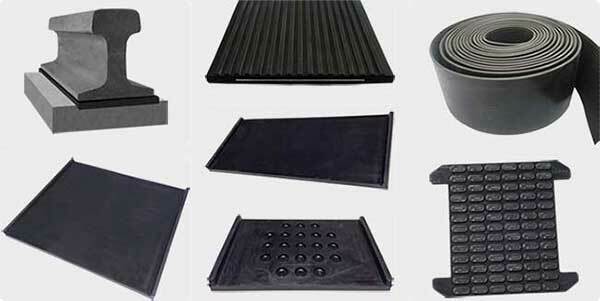 Rubber rail pads are normally designed to a specified load-deflection characteristic. The initial stiffness of the pad is designed to be low so that that their deformations under the springs toe loads is quite substantial. This ensures that the pad remains in intimate contact with the rail despite any vertical movements of the latter. When the wheel is over the pad, the latter’s stiffness must be high to prevent large movements which can result in the metal spring washer becoming loose. Such a load-deflection characteristic can be obtained by introducing grooves in the rubber pads. Mixing is carried out on a two-roll mill or in an internal mixer. In the case of an internal mixer, it can be done in a single-stage or double-stage mixing where the masterbatch, which was earlier prepared in the internal mixer, is finalized by adding curatives on a two roll mill. 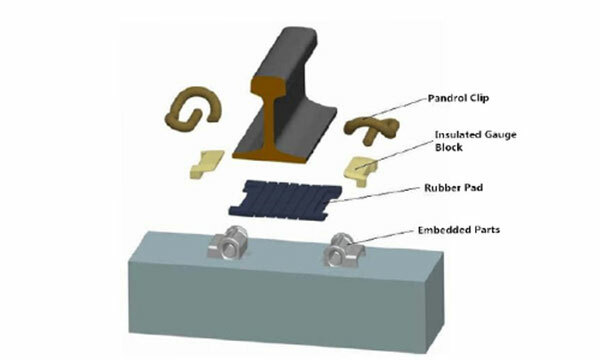 Rail rubber pads used for E-type rail fastening systems are with the similar functions of the rail insulators to insulate the rail above it from the tie sleepers laid below it, for effective protection against vibration and structure-borne noise as well. 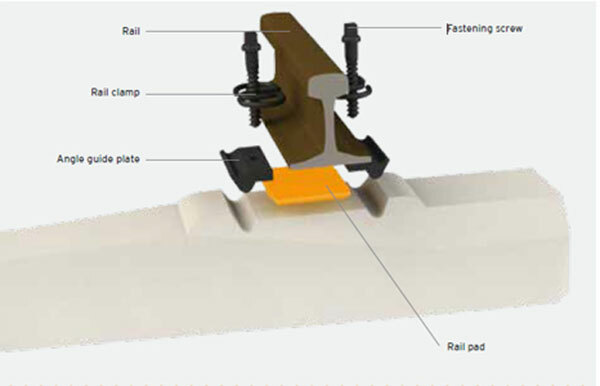 The rail pad works together with e-clips, rail insulators/insulated gauge blocks and rail shoulders/embedded parts to form a whole set of E-type rail fastening system. A rail pad in a SKL rail fastening system is a small but crucial fastener part, working together with SKL clips, screw spikes, plastic dowels, guide plates and so on. The elastic rail pads we produce possess a defined stiffness and demonstrably increase the elasticity of the track superstructure. With a higher level of elasticity, it contributes towards quiet running of the rolling stock, to meet today’s acoustic requirements on railway lines. Should be stored in clean, ventilated place. Don’t put under direct sunlight, and keep away from heat sources and chemical reagents. Don’t touch oil, organic solvent and other chemicals. 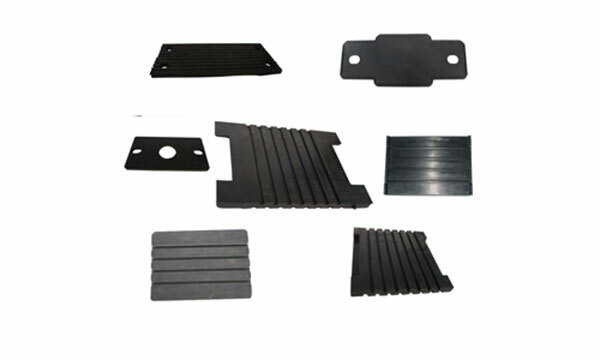 Our EVA/HDPE/rubber rail pads are with high elasticity, applying to types for rails such as rail UIC54, UIC60, BS80lbs, BS100lbs, and sizes as ordered. The pads can be customized with or without grooves, in various possible designs, depending on customers’ requirements.